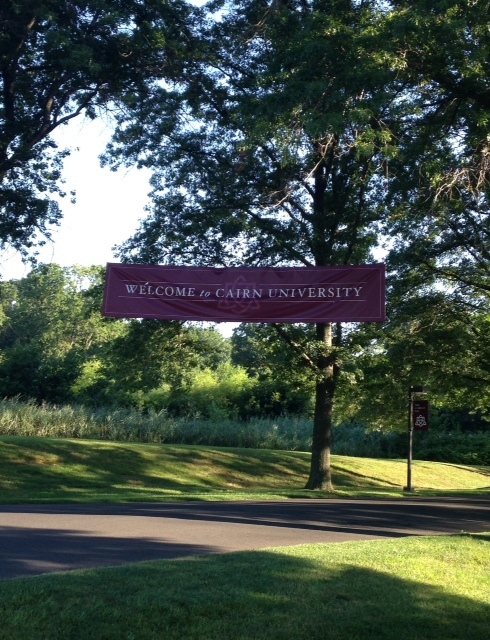 I should’ve arrived at Cairn University in Philadelphia in less than three hours. My problem was not listening to that sweet voice speaking from my phone giving directions. The brochure for the Greater Philadelphia Christian Writer’s Conference said take exit 44 off I-95 so that’s the way I wanted to go. I was sure my phone was rebellious and being annoying, insisting I get off at different exits…so I decided to ignore it until I reached exit 44. My journey began around 1:30 without any glitches. There was the usual sluggish traffic leaving long island and the wonderful smell of exhaust fumes and pollution, but no major problems. Shortly after crossing the Verrazano Bridge, clouds grew dark grey ahead until they burst. Sheets of rain poured as I drove to a rest stop, but I could relax since I had less than an hour to drive. The smooth ride slowed down until my car was crawling along with traffic for at least thirty minutes. It looked like two trucks had smashed into each other and the divider. A body lay on the ground under a bag with feet sticking out. It was horrific. All I could do was pray and keep driving. I knew something was wrong when my phone started adding time instead of subtracting minutes. At the next exit it said to take, I listened. Somehow it led me back on I-95 in the other direction. My phone said I had another hour and thirty minutes to go. Finally I reached the street and heard: “You’ve arrived at your destination.” I wished my phone could answer questions. “Are you sure? Where’s the university? I was parked in front of a house in a quiet neighborhood. I grabbed the brochure to check the directions again. The address on the front of the brochure, the same address I typed into Google Maps, was the address of the director of the conference. 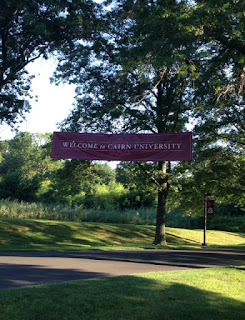 I was at her house, not Cairn University. I typed the correct address in to discover I had another fifty minutes to drive. At this point, I’d already driven for almost seven hours. I didn’t cry, just kept driving until I saw a sign for New Jersey, and panicked. Did I pass it again? What if I clicked on a different Langhorne? What if I was still going the wrong way? A gas station clerk assured me I was heading the right way. Forty more minutes. Would this ride ever end? Eventually, I arrived at the conference safely after eight hours of driving to hear the closing of the first meeting. One of the staff had me wait with a woman who also had a much longer bus trip because of the rain. We both had passed the same car accident on opposite sides of I-95, her leaving Maryland, me going there. She was so calm, accepting whatever circumstances happened. “God must have a reason.” And I agreed. I would not have met this lovely woman if I didn’t arrive at the same time she did. One of the speakers spoke about writing with God and following His direction. “Bohemian Creativity Realm.” Not forcing my plans, but enjoying the experience of writing with Him and accepting the twists and turns and ending up in a different place than expected. My drive was the perfect illustration. I thought I would arrive in time for the book signing and hear the first speaker—instead, I got to sing the last song about His Amazing Grace, and spend the evening getting to know Lynn. She lifted my spirit and helped me laugh about the unexpected. After the challenge of reaching my destination, I felt blessed. On the way home, I listened to the voice on my phone as if God were reading the directions. Next trip I'll bring an old-fashioned map.